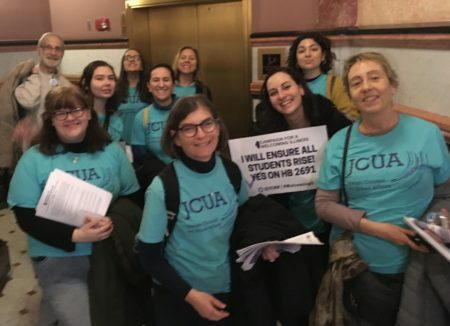 In March I had the opportunity to travel with JCUA and the Campaign for Welcoming IL to the capitol in Springfield. Being there reminded me how much work we still have left to do to fight for immigration justice. The first thing they did when we got there was sweep us upstairs to tour the building and to explain how a bill becomes a law. I realized that the last time someone had explained that to me I was in 5th grade learning about the constitution. I remembered the process for the most part, but it does seem strange to me that in the many years in between then and now I was not required to learn how our system works and how I can be effective in it. It seems backwards to me that in a system that is supposedly by the people and for the people, anyone who does not remember 5th grade Social Studies would be in the dark about how our government works and how citizens can be involved. Given our current political climate, it is difficult to view this as an oversight. After this educational moment, we were invited to bring campaign information to the offices of our representatives. My representative had stepped out, but we left information for her and let her secretary know that we would love for her to join us at the rally at 11am. I did not get the chance to speak to my district representative on this day. She, unfortunately, did not come out to speak with us during the afternoon and we were unable to find her later in the day as well. 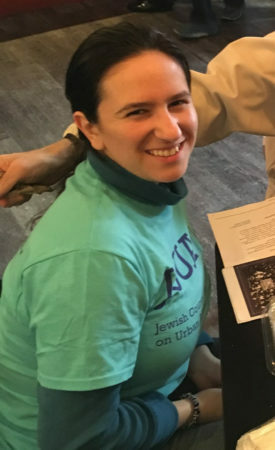 Being informed of her past involvement and memberships with organizations that support immigrants, I was surprised that she had not already signed on to co-sponsor the RISE and KIFTA acts. I felt confident that if I could speak to her face to face, if I could put the information directly in front of her, she would sign on without delay. 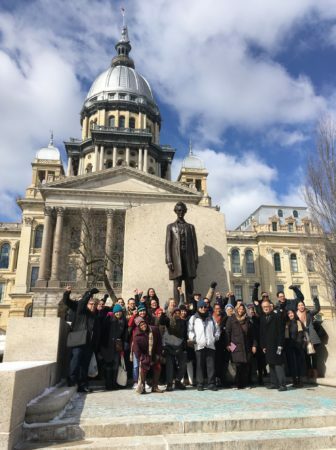 How could she not, representing a district with such a high population of immigrants, be in favor of a Welcoming Illinois? This was unfortunately impossible, and having checked who is currently co-sponsoring, I am left to wonder if the information I left at her office ever reached her, and who is holding her accountable. Though the bills are currently in the house, I decided to stake out the Senate, hoping to get early support from our Senators. I handed my JCUA business card, with my name and my senator’s name handwritten on the front, to the guards at the door. I then put my hair up and stood my ground, centered between the two thick red rope separators. You can picture a high ponytail, a dinosaur backpack, and a bright blue JCUA t-shirt blocking the path just enough to be noticed, but not enough to cause a fire-hazard. I stared at the large oversized door and hoped my intention of speaking with this senator would to be enough of a reason for her to come out. One of the guards told me “if the senator hasn’t come out by now, she probably won’t.” She may have meant it kindly, intending to help me to not waste my time. The other guard would smile and check inside to give me updates. When all hope was lost and most of the senators had left, he informed me that she did not appear to be in the chambers anymore and must have gone out the back way. At this update, the group decided to go to lunch. As we were leaving, he caught up with me to let me know that she came back! He then pointed her out to me as she was leaving. She walked fast, I had to chase her a couple of meters. The senator asked if that was us “making all that noise” this morning with the rally. I let her know it was and she said “good for you.” She then informed me that she always supports legislation for immigrants and instructed me to take the bill numbers directly to her office to get the paperwork started immediately. Unfortunately, we do not have Senate bill numbers yet, as the bills are still in the house, but when we do, we have an informed ally ready to go. While it was exciting to chase down a senator and get her verbal commitment to co-sponsor in the future, a more imminent concern is having enough votes in the house. It would have been a more tangible victory to reach my district representative and have a name officially added to the list of cosponsors. I will return to Springfield on the next day of action and focus my energy more specifically on our representatives. Being on the ground in the capital and speaking with elected officials face to face felt very direct. Being a part of JCUA has enabled me to see my impact immediately and that instantaneous response made our goals feel much more reachable. I’m excited to use the power of holding people accountable in person for our campaigns, and for building relationships to use in future campaigns.